Looking for a little historical sightseeing and fin in the water on your travels to Croatia? The resort island of Hvar has got it all! There’s an endless amount things to do in Hvar to keep even the pickiest of travellers happy. The natural beauty of the island is a rare treasure, thanks to the secluded beaches, hiking trails, and fields of lavender. It’s also home to a hilltop fortress, historic cathedral, and 13th-century walls. This luxurious travel spot has lots to keep you entertained. In fact, some travellers get overwhelmed trying to decide how to spend their time on Hvar. 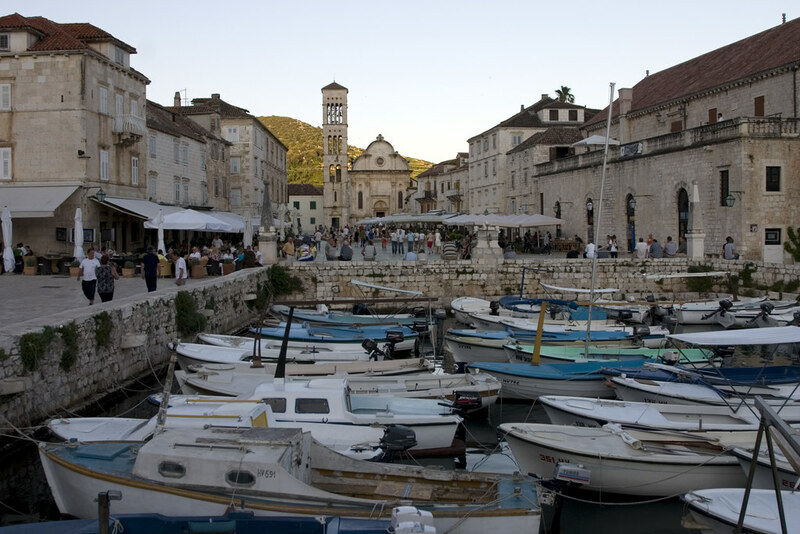 The harbour is one of the top Hvar points of interest and the first thing you’ll see when you arrive. It’s a busy, bustling port and a favourite destination on nearly any Croatia travel itinerary with ships arriving and leaving throughout the day and night. Most of the significant historical landmarks on Hvar Island are within walking distance from the harbour. You can easily reach St. Stephen’s Cathedral, Hvar Fortress, and other sites just minutes after getting off the boat. The harbour area is also a great spot to find fresh food. Restaurants, bars, and cafes line the streets surrounding the port. If you don’t know where to go in Hvar, start at the main public square. St. Stephen’s Square reaches from the bay to the eastern edge of the port where the cathedral stands. The bell tower of St. Stephen’s Cathedral is visible from most parts of the harbour. The building was erected in the 14th century, following the Gothic architecture that was popular at the time. The cathedral holds many important works of art, including paintings from notable Dalmatian artists. It was built on the site of a sixth-century church, giving you an indication of the rich history of the region. Your Hvar sightseeing trip wouldn’t be complete without a visit to the Franciscan Monastery. It’s one of the first things that you see as you arrive at the island as the monastery is built out near the sea and a must see whether you have 24 hours in Hvar or a couple days. The 15th-century monastery holds several important paintings, including a painting of the Last Supper that measures eight meters wide. The monastery is still operational, with a single Franciscan monk dedicated to the care of the building and grounds. While you don’t need to pay to visit the monastery, donations are suggested and help support the monk left caring for the site. Hvar has a lot of beaches as it’s a large island. While some of these beaches quickly fill up with tourists on a hot day, Dubovica Beach is often less crowded. It’s a great place to get away from the crowds and enjoy a little seclusion. Dubovica is also one of the most beautiful sites along the coast of Dalmatia. The beach is near Hvar and accessible via a park at the top of a hill. Most people rent scooters to reach the park and then travel down to the beach on foot. It’s about a ten-minute trip on sandy hills and pebble-covered shores. While the area is a little rocky and hilly, it almost feels as if it is a secret retreat. Dubovica is quiet and doesn’t attract as many tourists but still offers amenities. You’ll have a few food options, including several bars and restaurants. 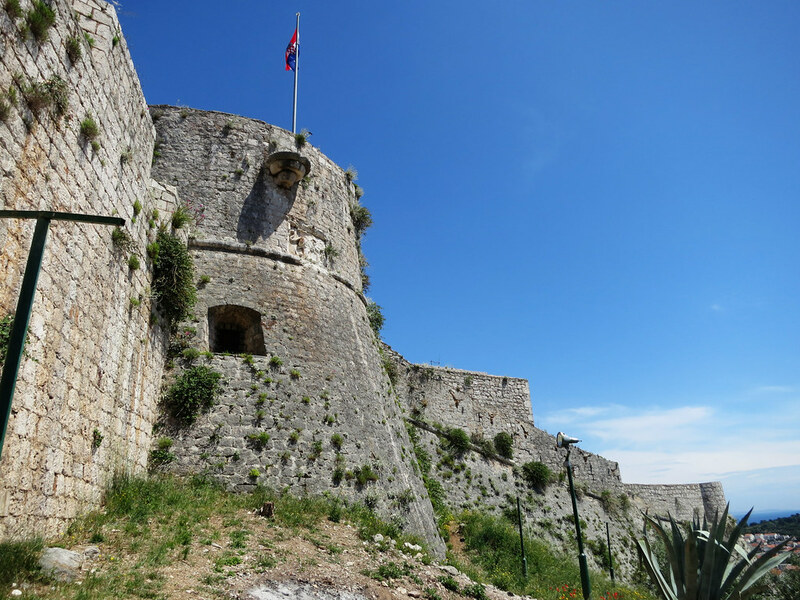 Any list of what to do in Hvar should include a trip to the main fortress. 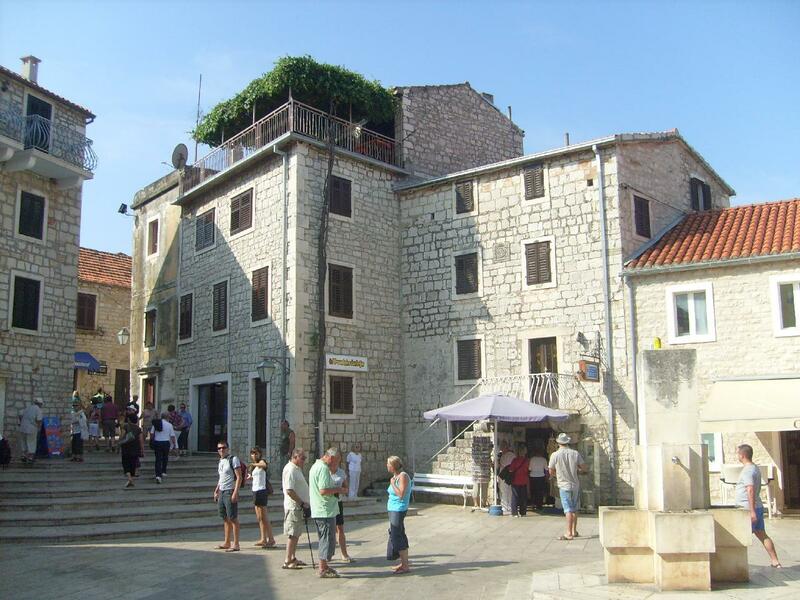 The Hvar Fortress (Tvrdava Fortica) is an ancient structure built to increase the defences of the port town. The entrance to the fortress is a few minutes away from the harbour. From there, it’s another twenty minutes to the fortress itself. When you get inside, you’ll find endless hallways leading to various rooms and other hallways. Most areas are roped off, making it easy to find your way around the labyrinth of passageways. The fortress includes several rooms that showcase historical artifacts, similar to mini-museums. The main highlight is walking on top of the ancient fortress walls which provides a wonderful view of the harbour. Sveta Nedelja is one of the best places to visit in Hvar, thanks to the old winery and the interesting views. The town was built at the bottom of the highest peak on the island. It’s also right below a cave that once housed an ancient Augustinian monastery. The cave was once inhabited by early humans during the Neolithic period, adding to the historical significance of the area. The village was built halfway to the cave against the sheer cliff of the peak. To reach it, you need to travel a winding path through a wooded area. Above the village, on the steep slopes, you’ll see the famous vineyards that are still in use. The wine has a full flavour and deep red colour and is available from a local winery. While many of the top things to see in Hvar are near the main port, there are still attractions scattered throughout the island, including Jelsa. This resort town is a popular destination for families and offers its own taste of history. It’s like a mini version of the Old Towns that you find in the centre of numerous European cities. The town has a public square, historic sites, and well-preserved ancient residential buildings. Jelsa was first mentioned in 1331 so the exact date that the town was established is unknown. To the south and east of the town are two ancient fortress – Tor and Grad. Beyond the historic sites near its centre, modern Jelsa offers many of the things that you’d expect from a resort town. You can find modern restaurants, shops, and hotels. Although the island stretches out over 60 kilometres long, choosing where to stay in Hvar isn’t such a big challenge. For most travellers, Hvar Town is the most logical choice as many of the top points of interest lie in & around here. For a quieter experience, you may also want to look into staying in nearby Stari Grad or Jelsa a little further afoot. Aparthotel Pharia: A budget-friendly alternative that’s located just a short walk from the beach. A lovely 15-minute walk along a seaside promenade will get you to the centre of Hvar Town. Rooms are clean & modern and offer superb views of the Adriatic and the surrounding olive groves. Hotel Fortuna: Another quiet option a little outside the bustle of Hvar Town in the village of Milna. Get the ultimate in relaxation on one of the several pristine pebble beaches in the area. Adriana Hvar Spa Hotel: The most luxurious hotel in Hvar Town, this property delivers modern rooms and classy amenities including a rooftop swimming pool & terrace with superb seaviews.